Earlier this year Densho traveled to Hawaii and interviewed Masamizu Kitajima, a Nisei from Ookala, Hawaii. After the bombing of Pearl Harbor, his father, a prominent Buddhist minister, was arrested by the FBI and interned in various facilities. 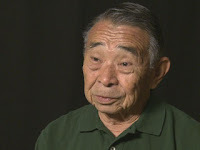 With little community support and five children to raise, Masamizu's mother decided to accept the U.S. government's offer and move the family from Hawaii to the Jerome incarceration camp, Arkansas, to reunite with Masamizu's father. In an excerpt from his interview, Masamizu describes his sudden understanding that his father wasn't coming home after being arrested. He realized that as the oldest son, he now had to assume the role of father-figure to his family, despite being only eight years old.